SUSAN BARBAGLIA, owner of Skin Deep Salon and Spa in New Providence, offers a wealth of knowledge and expertise as a leader in the beauty industry. With over thirty years experience in skin care, Susan can answer your most challenging beauty questions. Email your questions to advice@skindeepsalonspa.com. As I get older, I find it is harder for me to find cosmetic products that complement my aging skin. Are there any tips on proper makeup application and products for mature women that I should be utilizing? When it comes to makeup for women 45 and up, some of the rules you lived by in your 20s and 30s no longer apply. Usually, when women reach a certain age, they find that less is more and that they have to adapt their makeup routine to fit their change in skin’s texture and tone. Whether you want to minimize fine lines and wrinkles, make your eyes stand out or maintain a healthy, glowing complexion, a few beauty tips can help you achieve looking years younger! Nothing plumps up the skin better than hydration. It also helps everything glide on better, including your concealer, foundation, sunscreen, blush, and everything else. Dermatologists often recommend hyaluronic acid, which helps with aging skin. Using a collagen boosting moisturizer is also a great option! Keep your face, neck, and hands out of the sun to reduce the appearance of wrinkles and sunspots. Wear sunscreen on your face, hands, and neck, rain or shine, and hats if you are out in the middle of the day. Using an SPF is essential for women of all ages. In the winter months, you may need a creamier formula for added moisture. In summer months you may that find your skin will perspire more so you may need a lighter one. Layering is key a fluid, eye cream, moisturizer and then a sun screen is best. If all the products are appropriate for your skin type, it should not feel heavy and layering will give you maximum protection. If you want a little extra help in transitioning to a better way to apply makeup, sign up for Skin Deep's master class on April 25, 6-8pm. The workshop will be chock full of tips and tricks, with a focus on new Spring trends for a fresh new face. Call 908-508-1800 to register. 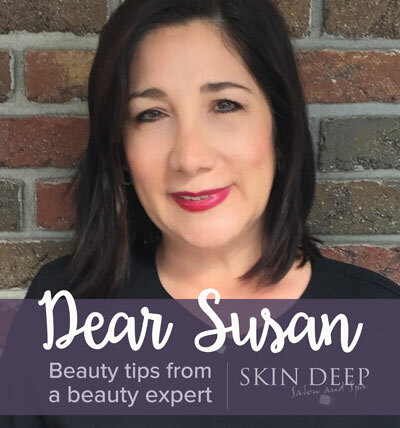 SUSAN BARBAGLIA, owner of Skin Deep Salon and Spa in New Providence, offers a wealth of knowledge and expertise as a leader in the beauty industry. With over thirty years experience in skin care, Susan has a well rounded foundation of beauty expertise. She has worked with one of the top plastic surgeons in the area, trained with the industry's best and brightest talent, attends elite industry training at the following institutions: Babor's Advanced Training in Aachen, Germany, Bioesthetique in Paris, and Master Skincare seminars with Repechage. She remains a premiere resource on the latest industry breakthroughs to bring the most advanced offerings to her clients. Whether you are looking for a new product, the latest beauty trends or simply want advice on a personal situation, Ask Susan! She is happy to take your beauty questions. Email your questions to advice@skindeepsalonspa.com.